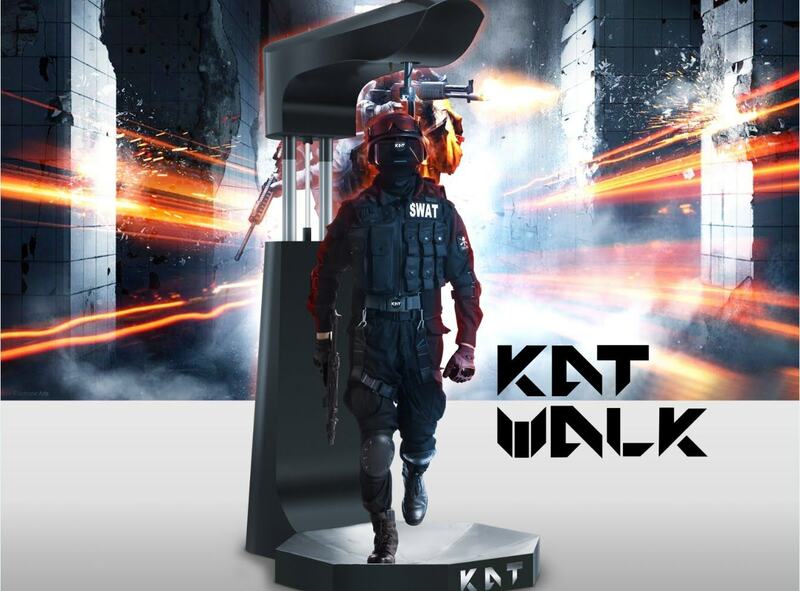 It might not be the future of Virtual Reality, but KAT Walk VR has seen the arcade virtual industry market take on a massive boost with its omni-directional rig. The treadmill type set up has seen a massive insurgence in special VR arcades due to the rising cost of specialist equipment. These pricey constructions, however, are often shipped in prototype stages, with little focus on simulating natural human movement without cumbersome restrictions on the player. When technology company KAT opened its Kickstarter page in the summer of 2015, it set to change all that. 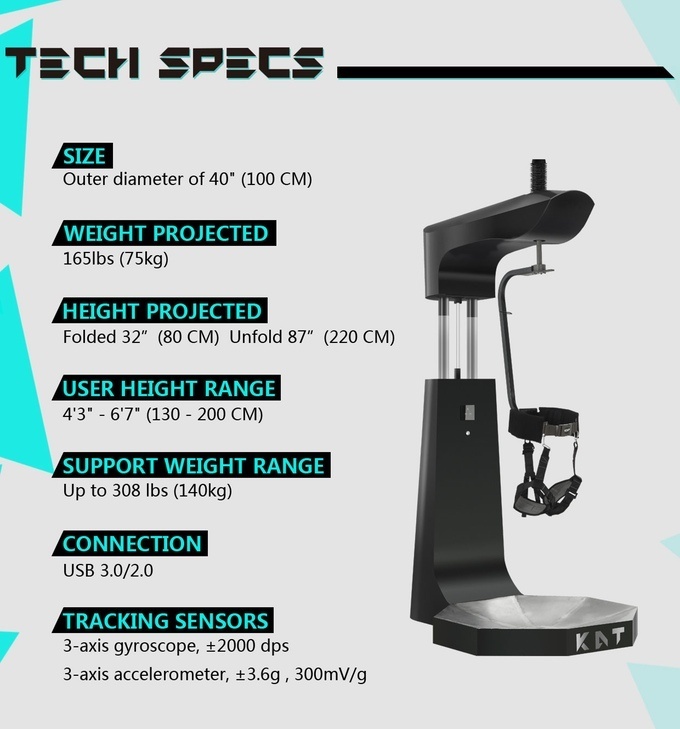 The KAT Walk ‘treadmill input device’ has two aims; to simulate natural movements and walking in an unrestrictive design. Offering 360 degrees of virtual reality, the open plan structure allows players to walk forward or backward, run, jump, sit, and even crouch thanks to its inbuilt sensors and wearables. Under your feet, a high friction platform with specialist shoes that replicate real walking forces ensure tight movements that avoid the slippery surfaces that have blighted similar machines. The light harness and actual structure also move with you, allowing jumps to feel unrestricted and comfortable. It’s easier to keep your balance, presents a more intuitive learning process, and reduced motion sickness. The technology maps natural body motion to a keyboard or gamepad which means any Oculus Rift or HTC Vive title to use these controls is compatible. Footage often favours the run and gun features of first person shooters, the genre best suited to the actions and movements afforded by this hardware. With a $9,000 price tag, KAT didn’t quite meet their projected consumer-based market. 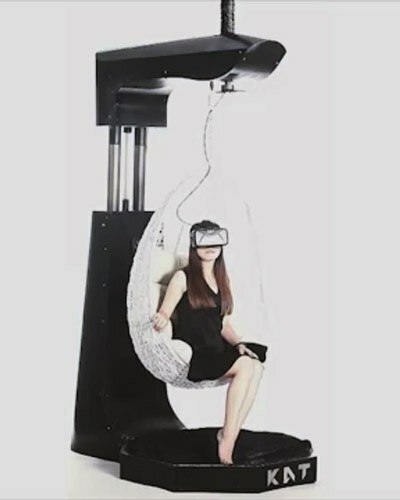 They are, however, in the process of selling their creation to a number of Chinese arcades which have been quick to jump on the public VR resurgence. It’s easy to see how the company will aim to return to their consumer-based focus in the coming years. Their original 2015 Kickstarter was largely based on public consumption, and they are rumoured to be in the process of slimming down their machine to make it more living room friendly. It’s unlikely, though, that these elite pieces of gear will make it comfortably into the homes of consumers. Costly, cumbersome, and rarely aesthetically sound, it’s going to be tricky to persuade housemates, partners, or parents to relinquish a corner of their living space. Nevertheless, KAT Walk VR will find its place on the arcade scene in the west soon enough, and I’m confident we’ll start seeing more elitist pieces of machinery, even if they do ultimately die out in favour of easy living-room headsets.